What’s it like to go through coding bootcamp with your spouse? A few months after their wedding in 2017, Brian and Alicia Evans enrolled at LearningFuze in Orange County to learn to code together! With Alicia’s background in publishing and nonprofit work, and Brian’s background in music and data management, they came in with very different skill sets, but both ended up loving it and found great jobs. The pair tell us about the ups and downs of going through such an intense program with your partner, how they bonded with their LearningFuze cohort, and how they both ended up working at the same company a few months after graduation! What are each of your backgrounds? How did you each decide you wanted to go to a coding bootcamp? Alicia: I got my MFA in Creative Writing. I worked in publishing in New York, then switched to non-profit work, supporting people with developmental disabilities, and working as a Case Manager at a family homeless shelter. I knew I was doing good work but it wasn’t sustainable for me emotionally or financially. A friend from one of my jobs in New York quit to go to a full-immersion bootcamp and loved it. That really appealed to me, but it seemed like a big risk to move into another career that I wasn’t sure I’d love or be any good at. When Brian and I were engaged, I told him I thought he would be an excellent programmer and did research on bootcamps to get him excited about it. He thought if I was excited about it, I should do it too. I took a few Codecademy courses and really liked it. 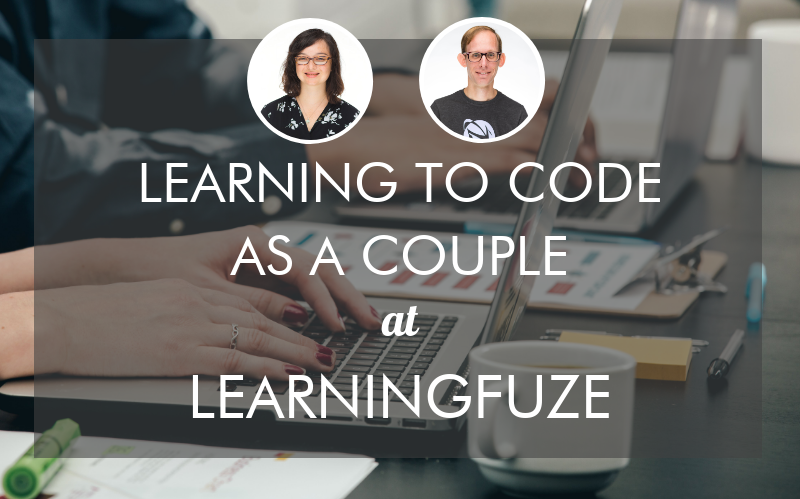 A couple months after we were married, we quit our jobs and enrolled at LearningFuze! Brian: I have been a musician for most of my life. I made some money from music and had some part-time jobs. Right before LearningFuze I was working full-time doing data management for a healthcare company. This involved SQL querying, data merging, and some Python scripting. It was something I fell into and learned as I went. I had coded some Apple Basic when I was young, and made websites for bands in the late 90s and early 00s. But I had gaps in my knowledge that prevented me from working as a developer. When Alicia was trying to convince me to go to a bootcamp, I was resistant to the idea. She started looking into it and eventually narrowed it down to a few schools. She invited me to go to an info session at LearningFuze. She was sold on it; I was less sure, but thought it was interesting. Then, I had a really bad day at work and decided it was time for a change. So I signed up! What made you each choose LearningFuze over other coding bootcamps? My wife was pretty set on going to LearningFuze. The lead instructor sold me on the idea of learning one 'stack' and learning it well, rather than the multi-language approach some competitors had. The career support at the end felt like a big value add. To know that I would have help finding work was a BIG deal for me. What was the application and interview process like for each of you? What was your LearningFuze cohort like? Alicia: We had an amazing cohort. We were in the same cohort but mostly sat with different people. We had 17 people to start with and 16 graduated with us. Five of us were women, and most of us were in our 20s and 30s. There were a lot of people with science backgrounds and a couple of tech and engineering folk. We tried to keep things upbeat, ask each other for help and offer it, and keep up a spirit of “we’re all in this together” rather than one of competition. Brian: Everyone was really supportive and I felt like we worked through things as a unit and tried to make sure no one got left behind. Since you spend so much time together, these people become your family during the program, then become your peers and network connections afterward. We regularly see many of the people from our cohort even now, 9 months after the program, and I work with three other LearningFuze alumni at my job. The network and friendships you make at a bootcamp can be a big part of finding good work. What did you each think of the learning experience at the bootcamp? And what was it like learning with each other? Brian: The learning experience suited me much more than traditional college or high school education. The day was split between projects and lecture time, with breakout sessions. If something was too easy, I could do a more advanced version. If I was struggling, there was always an instructor or another student to help me through it. The teaching style was very interactive. People were excited to share solutions and see other people’s solutions. Alicia and I sat together at first, then started sitting near people who challenged or supported us in various ways. With different backgrounds, we had different struggles. We spent breaks together and provided emotional support when things got hard. But mostly we were two students who happened to show up and leave together. We had one or two frustrating moments while working together, as our learning styles are different. But those were the exception. Alicia: The learning experience was good. It felt like chaos basically all the time and was pretty frustrating a lot of the time. I discovered that I liked the gratification of solving a complex problem, and it was so much better to go through with people who became close friends. Brian and I tried to pick separate paths and not sit by each other. He did back end, so I did front end. How did LearningFuze prepare each of you for job hunting? Do you have any advice for other bootcampers going through the job search? Brian: In the second half of the bootcamp, resume and interview prep was a regular part of the curriculum. We did mock interviews, code challenges, and whiteboarding. Staff helped us craft resumes to highlight our new skills and present our past work in a favorable light. They prepared us for the idea that it may take a while to get responses and be prepared to send up to 100 resumes for the first job. I was a little discouraged at first, but sure enough, interviews and offers started to come in. My advice: be patient, stick with it, ask for help from the job support staff. Alicia: When you start applying, it’s going to feel like nothing is happening. Get as much feedback on your resume and cover letters as you can. When you start to get responses, you’ll keep getting responses. I put a lot of emphasis on my portfolio. I wanted each project to showcase a different skill and also reflect a part of my personality or history. I spent 6 weeks working the same long hours I worked in the bootcamp, putting together my website and portfolio. I also wrote cover letters wherever I could and didn’t limit myself to entry-level only. Congratulations on both of your jobs at FormulaFolios! How did you each find your jobs? Were you hired at the same time or separately? Brian: We were hired separately. I responded to a job ad on Stack Overflow because it listed Python, which I really enjoy. It turned out to be a PHP position, which I was less interested in. But I did a phone interview, I really liked the engineering manager's management style, and they asked me to come in for an in-person interview. I had another offer too, but I liked the stability of the position and company, and the offer was solid. In a weekly one-on-one with my boss he asked how Alicia’s position was going. I mentioned that her contract had ended and she was looking for work. He suggested she learn Ruby On Rails and contact him if she was still looking for work. A few weeks later, I mentioned that she had accepted a C#/.NET position. He asked if she'd entertain another offer, so I called her to find out. She ended up taking the position at FormulaFolios and we have been on the same engineering team (though on different sub-teams) since. It has been great! Alicia: It’s funny how it worked out. Brian hadn’t been trying to get me a job there; it just kind of worked out. I actually worked two contract positions before I started working at FormulaFolios doing exclusively React.js work, which I found on Indeed.com. Can you tell me what FormulaFolios does and what you each work on there? Alicia: FormulaFolios is a fintech firm focused on smart investments. My title has been Site Accessibility Engineer, but I am moving over to one of the Ruby on Rails teams. My next team will be made up of three women. It’s pretty cool. We all sit together and get along, so I think it will be great. My current project is writing a Python program that audits all our sites for accessibility. I had never used Python before working here, but it wasn’t so hard to pick up. I’ve also done accessibility remediation for Wordpress/PHP projects. We have two-week sprints, including grooming meetings, daily standups, and an end-of-sprint retrospective. We always know what we should be working on, which takes away a lot of stress, and there are many opportunities to ask questions. Brian: My title is PHP Developer. The engineering team has around 16 people. My team has four people including myself. My team builds marketing websites for our company, its products, and the financial advisors that contract with it. We use a combination of PHP, Wordpress, SASS, and VueJS to create those websites. A typical day starts with a morning standup, then I work on whatever assignments I have for the rest of the day. 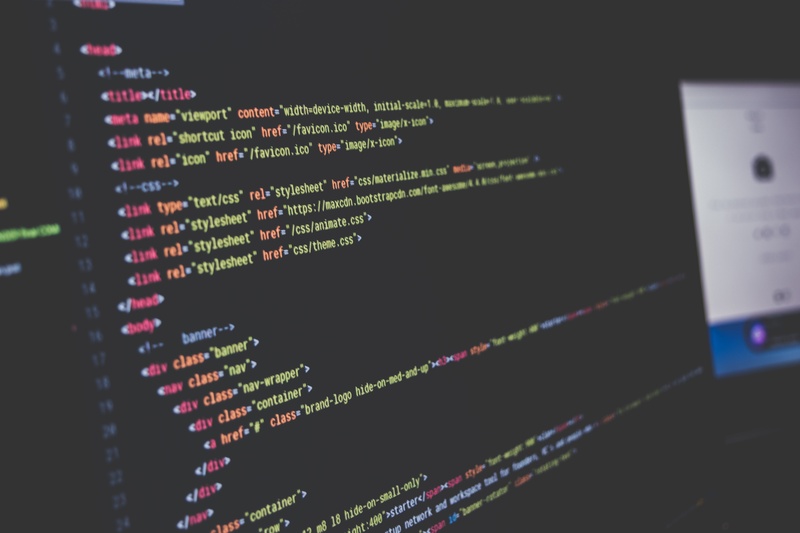 I am currently building the front end for a financial advisor's website and had recently been working on the PHP code for an interactive information management portal that lives in the backend of one of our websites. Do you feel LearningFuze prepared you for the role? What was the learning curve when you first joined, and how are you continuing to learn? We are encouraged to stay up to date on tech, do research and we often talk about new and emerging things. There is also a focus on doing things right, rather than doing things fast. That leads to more education, sharing knowledge, and deep Stack Overflow rabbit holes. Alicia: LearningFuze got my foot in the door. What I discovered – I’ve been offered a lot of jobs at this point – is that people tend to care more about how you think, than what languages you know. Once you know one programming language, the rest are easy to learn – that’s something that’s become very clear for me. I’ve been able to pick up PHP, WordPress, Python, and Ruby for different projects at work pretty quickly because of the foundations I learned at LearningFuze. You also learn how to not know something and just set to figuring it out. We have quarterly meetings, an active Wiki page that’s always growing, and lots of documentation. We are encouraged to review each other’s code. We are expected to work independently, but there is sometimes mentorship as needed. How have you used your past experience on the job? 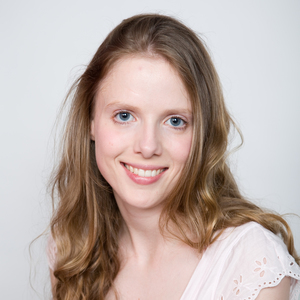 Alicia: I just happened to be offered a job as Site Accessibility Engineer after working for five years with people with developmental disabilities. It’s something I knew a fair amount about and felt strongly about as well. My writing skills have come in handy as well. Brian: At my last position we had to deliver results quickly and reliably. That work ethic has carried over to this position. I also sometimes use the SQL skills I picked up at that position. What have been each of your biggest challenges or roadblocks in your journeys to becoming fully fledged software developers? Alicia: You have to feel comfortable not knowing answers and not feeling confident in what you’re doing. You’re never sure if you’ll have what it takes to finish a story, but somehow you do. Brian: The biggest challenges prior to finding a job were perseverance and patience – putting in the work and trusting that something would come. There were occasional low moments where I thought things were too tough or that maybe this wasn't for me. But I stayed the course and reaped the rewards. On the job, the challenges are around learning to do something someone else's way. I imagine many developers struggle with this. The result is code that is familiar to a whole team rather than an individual, so I see the benefit, it just takes time to get used to. When you look back at the last year, what role has LearningFuze played in your success? Would you have been able to get to where you are today by self-teaching? Alicia: I would say it’s possible, but it would have taken a lot more time. I definitely self-teach a lot now, but I have the necessary base understanding to do so. Brian: I am a big proponent of self-guided education. I am constantly learning and picking up new skills. That said, I do not think I would have gotten to where I am without the focused learning environment and program that LearningFuze provided. I would have still had big gaps in my knowledge, I doubt my confidence in my skills would have been as high, and I would have lacked a support network. So maybe it would be possible by self-teaching, but it would have been a difficult and long road that only the most determined of people would see the end of. Do you suggest other couples do a bootcamp together? Alicia: I had a great time going through the program with Brian. It can be a strain on relationships if one person is fully immersed in a program like this and the other is not. I don’t recommend all couples go to bootcamp together. It’s not going to work if you’re glued to the hip. But if you know yourselves, you know if you can do it or not. LearningFuze itself was skeptical we’d be able to do the program together. But we’re both stubborn and had to prove they were wrong about us. Plus, this had to work. We’d both quit our jobs, and there was no going back. We learned a lot about how to communicate about work, which really helps us now that we’re at the same company. Brian: It very much depends on the dynamic of the relationship and how you react under stress. I think doing it together is probably a better idea than doing it separately, with a few caveats. If you are a couple which argues a lot or doesn't know how to be each other’s support system, then it may not be a good idea. But if you know each other well, and know how to be adults in a sometimes stressful situation, it could be great. You could go through something life changing with your best friend/partner. It was great for us, and I imagine would be for lots of couples. Alicia: The most important thing is, you’re going to feel stupid. If you know you’re not, that helps. But, it’s an inevitability, so lean into it. Ask the stupid questions – it speeds up your understanding. If you think you’re going to figure it out on your own, you’ll end up far behind everyone else. Realize that no one is good at everything; everyone is struggling with something, and most people are struggling most of the time. Put in the time – 10 to 12 hours a day – you spent and risked a lot to be here! And make it your own. Brian: My advice is to do it! I tell that to almost anyone looking to change jobs. Coding is not some kind of magic (though it does feel that way sometimes). I believe that anyone who is willing to struggle through problems, put in the time, and take it seriously can have a new career and a new skill set. We were told at the info session that we would be giving up three months of our lives to change our lives. That is exactly what happened. It was the best possible change and lived up to all of the hopes I had for our outcome. Find out more and read LearningFuze reviews on Course Report. Check out the LearningFuze website.